Editor’s Note: In order to familiarize you with the next major version of Mac OS X, code-named Leopard, we’re taking a closer look at each of the features Apple has unveiled. Our second profile looks at the changes made to Dashboard, OS X’s layer for widgets. 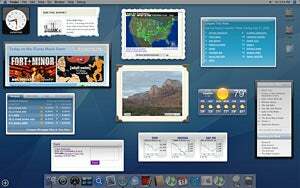 Dashboard, the feature introduced in OS X 10.4 that puts often-used “mini apps” in a layer floating above all your application windows, has been greatly enhanced for Leopard. Though there’s only one new widget—a Movie widget to quickly find movies and showtimes in your area—there are a couple of other really interesting features in this upcoming Dashboard iteration of OS X 10.5. The new black Open Page in Dashboard button in the Safari toolbar will open a Web page in Dashboard, allowing you to use the Web Clip feature to capture data on that page in your very own widget. Once you have the proper area selected and sized, you click the Done button, and that’s it—you’ve got yourself a widget. You can even choose from a few different themes for your widget by clicking the standard “i” button to see the back of the widget. This ability for anyone to quickly and easily create a widget of their favorite Web pages appears to be amazingly useful; no longer will you have to wait for a programmer to make a widget for you—just make your own. Dashcode—the new widget assembly tool in Leopard—starts by offering you a library of options for what kind of widget you want to create. Even if you’re not a programmer, you can use one of the templates to make your own official widget—all with absolutely no coding. Drag in an RSS link, for instance, and you’ve created a new RSS widget. While you’ll want to have some coding knowledge to really take advantage of Dashcode, experienced power users may be surprised by what they can do. Widgets built with Dashcode can be submitted to Apple.com for download. Finally, Apple has added .Mac syncing to Dashboard. Now you’ll be able to share your widgets and Dashboard settings across your entire collection of Macs—assuming, of course, that you have a .Mac account. The Web Clip feature is really for anyone at all who has ever wanted a Dashboard widget for an oft-visited site. From Apple’s initial demo, it really looks to be about as simple as possible; click a button, drag, resize, and you’re done. Dashcode will appeal to both programmers and inquisitive power users, as the tools and templates the app provides really do open up the world of widget-writing to many who may not have previously felt like giving it a try. The addition of the widget-building Dashcode app in Leopard likely means an exponential increase in the number of Dashboard widgets available. 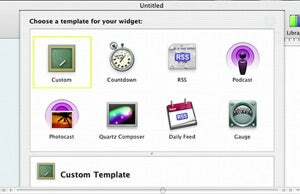 With more than 2,500 widgets available as of this writing, and Leopard (with an assist from Dashcode) making it likely that we’ll see an exponential increase in that number, nothing was said of better tools for managing your installed widgets. If you’ve got 30 to 40 widgets installed, for instance, browsing the horizontal widget selection screen is a time-consuming process on a MacBook—lots of clicking the Next button to scroll through your collection. What also wasn’t clear is what happens to a user-created widget if you close it. As with a real widget, it obviously disappears from the screen, but does it remain somewhere in your collection of widgets? If so, what name would it have? The demo never showed anything like a save dialog where you could name your widget, so it’s quite possible these user-created widgets are temporary items—once you close one, it may be gone for good. The new Web Clip feature in Safari will let anyone make their own useful informational widgets. This is a great advance in Dashboard, for no longer will users be forced to wait for a programmer to create that perfect widget for their specific needs. Add in the new Dashcode development tool, and Dashboard and its widgets look poised to continue their explosive growth in Leopard.